Intel Braswell Dual-core Processor Celeron N3700-2.16GHz, Intel HD Graphics SODIMM DDR3, 1600/1333 MHz, 1.35V, 8G max, 4x USB 3.0(2+2), 2x internal USB2.0, 1x HDMI Port 1.4a, 1 VGA port (4K), 1x SATA3 S/p 2.5" HDD/SSD, LAN 1GB,Kết nối Wifi Wireless- AC 7265M2 (IEEE 802.11 ac, Bluetooth 4, Intel wireless Display) Audio 8 Ch(7.1), Intel Chassis + Adapter 19V DC 65W. 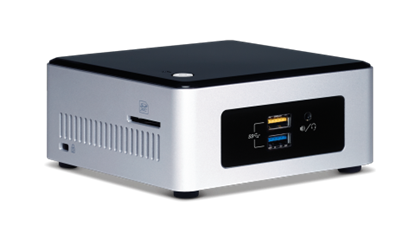 Grass Canyon is the first, fully pre-configured Intel® NUC. Built with a quad-core Pentium processor, 2GB of DDR3L RAM, and 32GB of on-board solid-state storage, Grass Canyon also comes with Windows 8.1 with Bing* 32-bit pre-installed with the latest Intel® drivers. This NUC also includes new features such as a VGA port, SDXC card slot, TOSLINK audio output, 4x USB 3.0 ports, 4K video, and 802.11ac WiFi. Plug-in your peripherals and begin watching, playing, creating, and sharing! Intel Braswell Dual-core Processor Celeron N3050-2.16GHz, Intel HD Graphics SODIMM DDR3, 1600/1333 MHz, 1.35V, 8G max, 4x USB 3.0(2+2), 2x internal USB2.0, 1x HDMI Port 1.4a, 1 VGA port (4K), 1x SATA3 S/p 2.5" HDD/SSD, LAN 1GB,Kết nối Wifi Wireless- AC 7265M2 (IEEE 802.11 ac, Bluetooth 4, Intel wireless Display) Audio 8 Ch(7.1), Intel Chassis + Adapter 19V DC 65W.